Tottenham Hotspur travel to Stoke City’s Britannia Stadium on Saturday well aware that a huge challenge awaits them. The Potters have only lost twice at home this season and only once in their last eight games home and away, of which they have won five. After a difficult start to the season under new manager Mark Hughes, things have definitely stabilised and if Spurs can take encouragement from anywhere it is that, having secured Premier League survival, Stoke have nothing left to play for bar pride. This was obviously going to be a very transitional season for Stoke, with the Tony Pulis era ending after seven extremely successful seasons due to concerns about the style of football and the Welshman’s continual and unsustainable spending on transfers. The statistics show that if Mark Hughes’ mandate was to make Stoke a more progressive outfit, then he has succeeded. Previously infamous for the directness of their attacks, they are now below thirteen teams when it comes to long passes played per game. They are fine to let the game ebb and flow, attacking when they get the chance but not trying especially hard to win it back. As such, they are smack bang in the middle of the rankings of average possession statistics and also of short passes played per game. If there are concerns, it is that they still struggle to make chances and to score goals. Their average of 10.7 shots per game is the lowest in the Premier League and only 3.5 of those shots end up on target. They only attempt 6.9 dribbles per game, the fifth lowest number, and they do not cross the ball or literally throw it into the box anywhere near as much as they used to. Still, with Ryan Shawcross and Peter Crouch mainstays in the side, they have preserved an aura of aerial invincibility. Stoke’s figure of 26 aerial duels won per game is by far the highest in the Premier League. Indeed, while their attacking identity has been somewhat altered, their defensive plan has remained more or less intact: sit deep, wait, clear it. They make 21.1 tackles per game, the fourth highest figure in the league, but only 12.9 interceptions per game, a generally poor figure. They tend to wait for the ball to get down the flanks and look to win it close to their own goal before launching a counter. This means they concede 14.5 shots per game, the sixth highest figure in the division, and a league-high 13.1 fouls per game. Given that they have such a high foul count – and also given that Mark Hughes is their manager – it is no surprise that they have amassed 71 yellow cards and 4 reds this season. Only Aston Villa have had more bookings and only Sunderland and West Ham have had more dismissals. The highly-rated Asmir Begović will continue in goal in what might be the twilight of his Stoke career. The Bosnian stopper has won many admirers during his time in the Potteries and an upward move is expected, particularly given his age, the fact that he will show his talents to a global audience in the World Cup this summer and also the fact that his contract will enter its final two years in the summer. Given that he plays behind an extremely deep defence and finds his responsibilities essentially limited to saving shots that come his way, one wonders whether he has the skillset to play for a bigger club given that they tend to play with high defensive lines and ask their keepers to be a bit more mobile, but that is no slight on Begović. As far as out-and-out shot-stoppers go, he is among the best. Geoff Cameron will play at right-back and #AverageFullBack enthusiasts will probably enjoy his Hibbertian performance. In an era in which full-backs are used essentially as wingers, Cameron is a throwback to the ‘stay at home’ type of years gone by. While his figures of 2.9 tackles per game and 2.5 interceptions per game are impressive and show a level of diligence and competence, his 0.6 crosses per game lead to 1 shot every other game – figures illustrative of his caution. On the other flank, Erik Pieters performs more or less the same function: 3.4 tackles per game; 0.3 crosses per game. The Dutchman is hardly adventurous but he looks like a tank and tends to kill anything that comes within three feet of him, so Aaron Lennon might be advised to think twice and make sure his shin pads are where they should be before taking him on. In the centre of defence, Ryan Shawcross does what Ryan Shawcross has always done: head the ball away again and again. And again and again and again and again and again. His figure of 8.8 clearances per game is very high and shows how dependable he is positionally but he remains an extremely limited footballer and Emmanuel Adebayor and Harry Kane should treat him with the disdain he merits. Alongside Shawcross, Marc Wilson will deputise for injured psychopath Robert Huth. The Ireland international has been surprisingly solid since stepping in, particularly so given that his most notable contribution to Premier League football before this season was a year of utterly disastrous showings at Portsmouth as the financially stricken club sunk like the Mary Rose. In midfield, Steven N'Zonzi and Glenn Whelan have done a good job of banishing the memories of footballs flying over the heads of Stoke City’s midfield duos. They each have a pass completion rate approaching 87%, playing 55.7 passes per game and 41.9 respectively. Both can strike a ball – and both have scored against Spurs in the past – so their threat is not to be taken lightly. It is possible that noted violent conduct enthusiast Charlie Adam will return to the side following suspension and a much-needed rest and if he does so it will either be for Whelan or for Stephen Ireland, who has been in and out of the team in what has been another transitional season. The Irishman has only recorded two goals and two assists and has only made one shot assist per game. 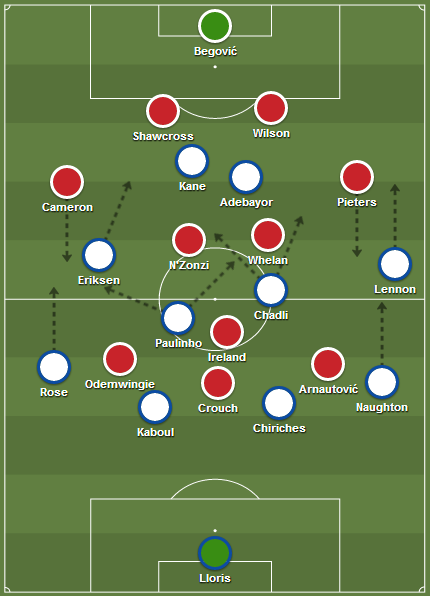 The front three play very narrowly, which contributes to Stoke’s problems: without width they find it difficult to stretch the play horizontally and their possession can become stodgy and predictable. Still, of late they have been picking up points and their strikers have been doing the business. Peter Odemwingie, who will start on the right, has 4 goals in 12 games since signing from Cardiff and his movement and creativity with the ball will be a big threat, as will the physical power and guile of Marko Arnautović on the other flank. The Austrian has taken the most shots per game of any Stoke player with 2.1, has given 6 assists, the most by any Stoke player, and created 1.5 chances per game, also a club high. Peter Crouch will lead the line and though his figure of 8 goals in 32 appearances does not sound too good, it is much more respectable when you realise he has only taken 59 shots in total this season. As far as conversion rates go, that is more than acceptable. Stoke are, then, a tough nut to crack, particularly given their recent good form. Their attacking is still somewhat laboured and they do rely on flukes and moments of individual brilliance to score goals more than would be desirable, but it would be a mistake to think this will be an easy game. Tactics Tim will presumably go with an unchanged line-up and stress that the same levels of commitment and concentration that were shown last weekend are even more necessary here.